Get those magazines off the shelf and clear up the clutter from the coffee table with this handsome side table. Featuring natural slate counter tops and a matte black frame this side table is sure to go well with almost any outdoor furniture collection. 3 separate shelves means that there is no lack of storage space available. Built out of durable aluminum means that this table is both sturdy and low maintenance. Taking inspiration from modern design, this elegant Danya B Square Rose Gold End Table with Black Glass-top top impresses with its slender and lustrous "geodesic" gold metal frame. The sleek black glass top provides an attractive juxtapose to the shiny metal frame. Prop the Danya B Square Rose Gold End Table with Black Glass-top in contemporary living rooms as an accent piece you and your guests will surely love. Hansel Patio Side Table Get those magazines off the shelf and clear up the clutter from the coffee table with this handsome side table. Featuring natural slate counter tops and a matte black frame this side table is sure to go well with almost any outdoor furniture collection. 3 separate shelves means that there is no lack of storage space available. Built out of durable aluminum means that this table is both sturdy and low maintenance. Hansel Patio Side Table is rated 4.5 out of 5 by 4. Rated 4 out of 5 by Anonymous from Solid made This console is being used on our screened porch! Perfect for serving food & beverages! Looks beautiful & well made! Rated 5 out of 5 by Anonymous from Great Table for Small Grills Bought this table for my small outdoor electric grill for my apartment deck. Perfect fit plus shelves below to stash BBQ paraphernalia. Easy to assemble. Rated 5 out of 5 by Pita1969 from great table We didn't read the assembly instructions so ended up doing the process backwards, but everything fit, went together fine and we're happy with the table. Going on the screened porch for the TV and some storage containers. Also matches patio furniture we had purchased elsewhere, so things look coordinated. 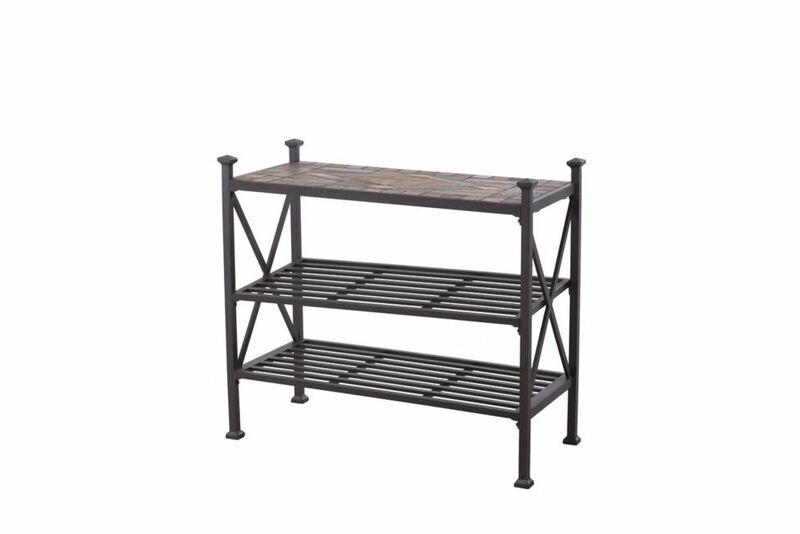 Rated 4 out of 5 by dred07 from Perfect console table After much searching, I decided on this console table. All the other consoles involved a lot of effort putting them together. This one took me 20 minutes at best. It serves my purposes perfectly. Some of the connecting tabs were a little bent but they straightened out very easily with a mallet. I would have given this table five stars if the tabs were straight. How many inches of clearance are there from the floor to the bottom of the first shelf?